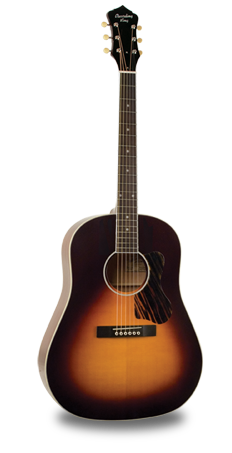 RAJ-126-SN, Dreadnought Steel String Guitar from Recording King. Recording King's updated the Slope Shoulder guitars with an extended scale length and vintage styling. Following the early mid-century “Jumbo” to “advanced Jumbo” change, they’ve extended their scale length to the full dreadnought scale of 25.4”. The 1-11/16” bone nut is designed for strumming, fingerstyle or flatpicking. Some changes have been made in the detailing too, with ivory body and fretboard binding, pearl fretboard dots, vintage-inspired Golden Age tuners and the classic Recording King headstock logo inlay. The slope shoulder guitars are available in two different models. 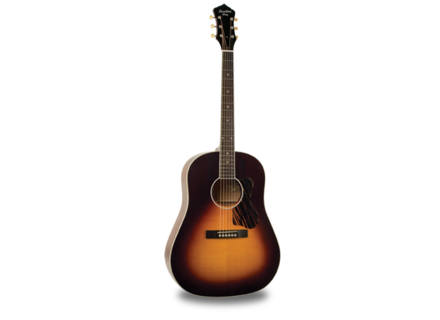 The RAJ-126 has a solid AA grade Sitka spruce top and solid African Mahogany back and sides. It’s finished in vintage sunburst with a classic firestripe pickguard, and ivory Golden Age tuning machines. For more details, see www.recordingking.com. Roland GA-212 & GA-112 Roland announces that the GA-212 and GA-112 Guitar Amplifiers are now available. Railhammer Hyper Vintage Pickup The Hyper Vintage bridge and neck model pickups are aimed at players who like a more traditional PAF style sound.